The pattern was pretty much perfect. I mean, I ended up with an extremely well-fitting pair of jeans. That in itself is impressive considering I had never made a pair of trousers before. I didn’t (gasp) even make a muslin first. Nope, jumped right in with my actual denim. They do have a sew along feature on their website and that was a huge help in understanding some of the steps. You can only fit so much content into a printed pattern before it becomes overwhelming anyways so it was really helpful to have the sew-along posts available in addition to the pattern notes. Every single step was exciting. 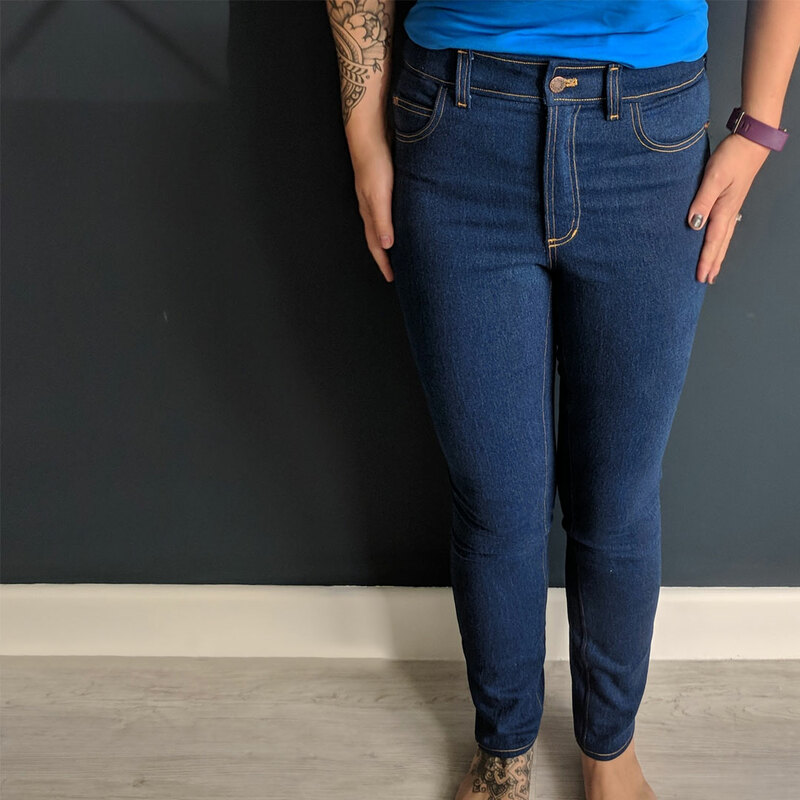 It was all new to me and each bit of making jeans is so different from sewing a top or a dress. I got excited when I sewed the crotch area together and they looked more like trousers. I got excited when I attached the fly front and zipper. The topstitching was a bit nerve-wracking as it was going to be so standout-ish on the jeans but even that was enjoyable. One of the most rewarding bits, even after all of that, was putting in the rivets and jeans button. Seriously, make a whole pair of jeans and then intentionally stick holes in them. That felt insane. I was certain at some point my bunched up denim in my punchers was going to put a hole in more than the intended area but all went surprisingly fine. I did use an old pair of punchers that were originally my husband’s grandmothers. While they worked ok I definitely have to buy some new ones. They were so old the rubber around the pincher bits was hardened and deteriorating. They also left little indentations in the rivets. I didn’t mind the indentations this time, they actually make them look like they have sweet little moons embossed into them, but I don’t want to have all my future rivets like that. All in all, I would definitely make another of these. This denim was perfect for my first pair of jeans. It handled very well and they are comfortable to wear. The only thing I’d say is I’d like if they became a bit softer after some wear/few washings as they are a tad on the stiff side. There is plenty of stretch in them, and I would consider buying the same fabric in a different colour, I think they might just be a bit thicker than the skinny jeans I’m used to wearing. It does feel like good quality denim though, I’m not concerned with it sagging over time. Which is nice after all the time invested in making them!